IT is hot and dry in Malaysia now. The Meteorological Department has warned of low rainfall or no rain during the northeast monsoon, which will end by the end of this month. It will result in hot weather conditions in most parts of the country. There are already reports of dams in some states drying up due to the weather. In Johor, the Sungai Lebam Dam is almost 2m below the critical level, while the Lok Heng Dam is showing a water level of 2m, just 50cm above the critical level. In Sabah, there are only two months of water storage left with eight rivers at critical level, and nine on alert level. 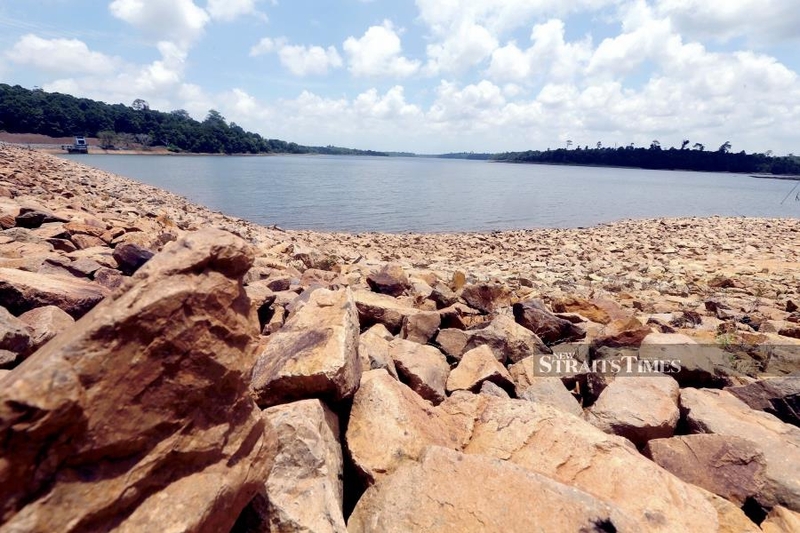 The overall water storage of dams in Sandakan, Kudat, Penampang, Tamparuli, Semporna and Lahad Datu is at 80 per cent. In Penang, the water level at Teluk Bahang Dam had dropped to some 70 per cent while the water level at Air Itam Dam dropped to some 65 per cent yesterday. In Kelantan, four rivers registered a decrease in water levels since the dry spell began early this month. The Drainage and Irrigation Department portal showed that water levels in Sungai Galas, Sungai Kelantan, Sungai Golok and Sungai Pergau have recorded a decrease. Freshwater is our most essential resource. To some people, water is their “happy pill”, the sight of gushing water out of the pipes is much welcomed while notices of water cuts or shortages will be received with outrage. Yes, our life revolves around water and every time there is a dry spell, there will be calls for the public to conserve water. The average Malaysian uses between 220 and 240 litres of water a day, which is at least 32 per cent more than the 150 litres recommended by the United Nations. Reports, citing data from the National Water Services Commission, showed that Malaysia consumed 10.786 million litres a day of water in 2017, with some 60 per cent of it used in domestic households. Malaysia's per capita household consumption was 201 litres during that year. But for a conservation programme to be effective, it needs to be sustained throughout until it has achieved its target. Several non-governmental organisations have given some tips to save water but how many of us have actually put this in practice? Do we use a wet towel instead of splashing water from a running tap to wash our face? Do we collect the water we use for washing hands, vegetables and rinsing dishes to water plants or flush the toilets? Do we use water in a cup to rinse our mouth after brushing our teeth? Do we turn off the shower when soaping or shampooing? Have we actually used rainwater/reclaimed water to wash our cars? My landlord may be the rare few that actually implemented some of the water-saving tips that can be found on the worldwide web. I remember finding a brick in the cistern of one of the toilets in my rented apartment when a plumber came to check a leak in the bathroom. The plumber said it was one of the tricks to save water. I think it needs more than just a behavioural change to make water conservation programmes work. Most times, it needs drastic action for people to sit up and take action; maybe one that burns a hole in the pocket such as an increase in water tariffs. The logic is simple really: the more you use or waste, the more you should pay for it. Thus, a higher water tariff could possibly result in people using water prudently. Furthermore, at 52 sen per cubic metre, Malaysia’s water tariff is among the lowest in the world compared with Thailand which charges more than RM1 per cubic metre, the Philippines (RM2 per 1,000 litres of water) and Singapore (nearly RM4). Reports show that about 97 per cent of our raw water supply for agricultural, domestic and industrial needs are derived from surface water sources, primarily rivers. Malaysia has 189 river basins — 89 in Peninsular Malaysia, 78 in Sabah and 22 in Sarawak. All the rivers originate and flow from the highlands. Now, what if we run out of freshwater resources? I am reminded of an incident when I was in Singapore with a group of journalists from Asean attending the republic’s national day celebrations in 2007. I asked one foreign editor if he knew what New Water is when I saw him opening one bottle. “No, tell me,” he said. I told him that it’s recycled waste water. “I’m not going to drink this!” he retorted, tossing the bottle in the trash container. He forgot that he had downed one bottle while at the parade. We were told while New Water is mainly for industria use, one per cent is piped into the water reservoirs. So, would we one day resort to using recycled wastewater too? Whichever effective model of conserving water we can formulate or find a freshwater elective, we definitely need to come up with one as soon as possible.